The guest on the October 13, 1953 edition of What’s My Line (exactly 65 years ago) had just celebrated her 69th birthday. Unlike other more recent occupants of her job, she had never been a high-fashion model, served on the boards of exploitative corporations, nor killed her friend by running a stop sign at 50 mph. Nevertheless, she managed. Thanks to YouTuber What’s My Line? 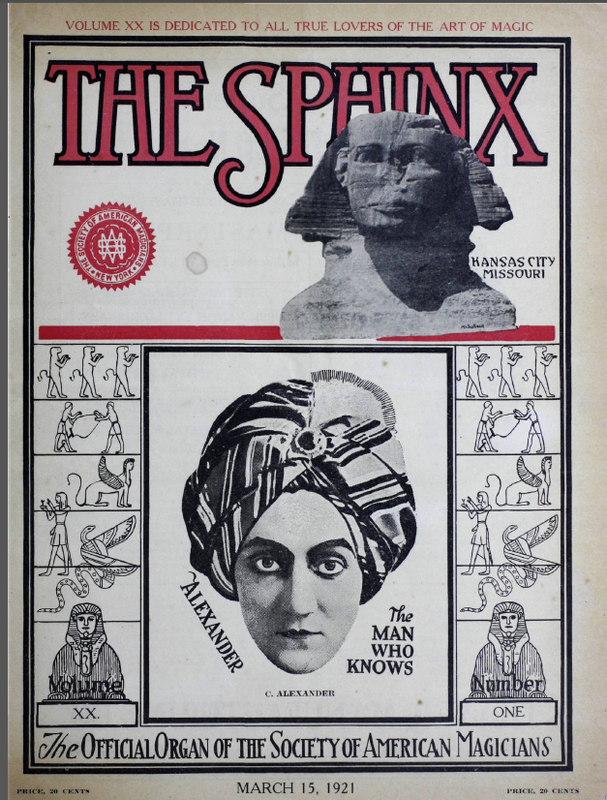 Here’s a wonderful bargain in magic history: the complete run of the fabled magic magazine, The Sphinx, on a DVD, all 50+ years of it, from 1902 to 1953, for $49.95. It’s published by The Conjuring Arts Research Center as The Ultimate Sphinx. 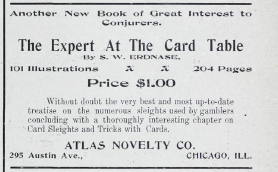 You will greatly enjoy this periodical, once the official mouthpiece for the Society of American Magicians, if you are any kind of theater or magic history buff. Throughout its run, the magazine was edited by such magic luminaries as William Hilliar, A.M. Wilson, and John Mulholland, making it a vital record of the history of the magical arts in the United States for the first half of the twentieth century. The DVD is very intelligently designed. Each volume of the periodical was scanned as a separate pdf file for easy transport and reading on a mobile device; however there is also a cumulative index that covers the entire fifty year run, so one can enter, for example, “T. Nelson Downs” as a search term and get references that span across the decades. In the second issue we have an article on the invention, history, and explanation of the Great Gold Fishing Trick associated with Chung Ling Soo. The article, written by Hilliar, goes on to say admiringly (with some chutzpah, I think) how Hilliar, along with Horace Goldin, immediately copied the effect, and greatly improved upon it. While I had no doubt that the three-card monte was alive and well as a scam in 1902, it was very surprising to me to learn that it was being performed as entertainment that early on. I wonder if someone can tell me of any earlier references to monte as an entertainment. MYSTIC MAGICIANS WORK WIERD CHARMS. Just when the darkness hung the deepest over the city Saturday, Sept.
Sixth Avenue, hidden away beneath the elevated railroad overhead. old colored woman stood beside her lunch stand. a feelin’ dat the debble is prowling aroun”. As soon as each mysterious stranger saw the sign he stepped to the door and gave a mysterious rap. A bolt shot back and the stranger quickly stepped inside. Not a word was spoken. Not a light was visible. The door was shut as noiselessly as it was opened and—then as quickly closed—ah! 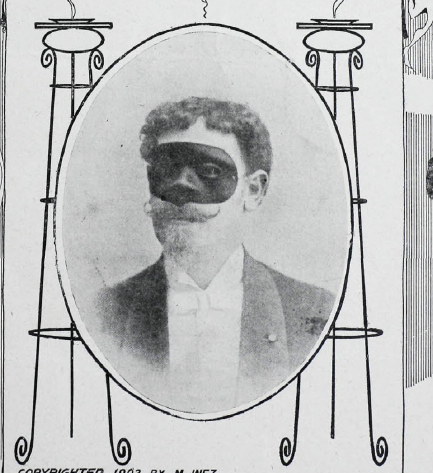 The occasion was a meeting of the recently organized society known as “The Society of American Magicians.” Every man of prominence who had ever practiced the black art was present. There were adaps in ledgerdemain, slight of hand performers, experts in juggling, illusionists, magicians, conjurers, enchanters, magis and high priests of the league of evil spirits. Through the store the midnight visitors were conducted until they found themselves in a miniature theatre at the back. Black curtains were drawn to shut out any light, and the meeting was called to order. After formal balloting as prosaic as is indulged in by ordinary mortals, the following officers were elected: Dr. W. Golden Mortimer, president: P. H. Cannon, first vice-president; Elmer P. Ransom, second vice-president; J. W. Sargeant, treasurer; and Francis J, Werner, secretary. The insignia of the order will be a gold button with the initials “M-U-M,” which is peculiarly significant—even for these wise men who follow the art of the Medes and Persians. By laws were approved and 14 new members were initiated. The society now has a membership of 74. There are two classes of membership. “Fellows,” those who make their livelihood entirely by the practice of this art, and “members,” who practice for amusement and pleasure. Among the most prominent of the members are Harry Kellar, Leon Herrmann, a nephew of “Herrmann the Great,” Imro Fox and Horace Goldin, who, although the youngest is considered as clever as any. BRENNON & MARTINI, the alleged magicians, who make a living by exposing tricks on the public stage, are playing the Orpheum circuit. They were in Kansas City week of Oct. 12 and Omaha week of Oct. 19. They expose during their act the egg and handkerchief trick, rose ii. button-hole, passe-passe, chair servante, torn umbrella and handkerchief changing globe. In spite of Mr. Martini’s promise not to expose the use of the servante in his act he continues to do so. The Marquis is a born artist and his magical conceptions were born with him. 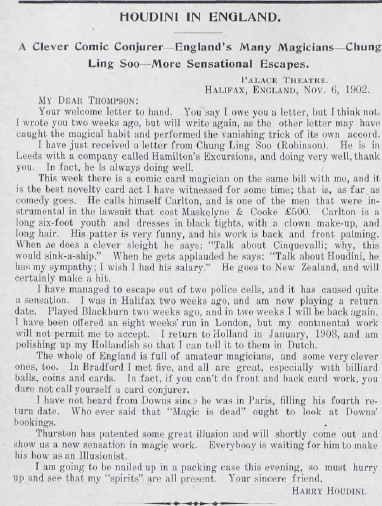 He has had a wonderful career and did not take up magic until late in life; at the age of 43, after losing 800,000 francs at Monte Carlo, he decided to adopt magic as a profession. Making his debut in March 1894, he was an instant and decided success, creating sensation everywhere he appeared. His success was so pronounced that he had many imitators who donned the masque and took his name outright and traded on his reputation. 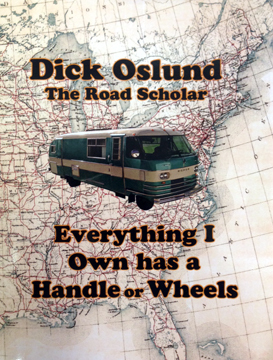 As I said, I have just scratched the surface of this first volume–and there are fifty more to go! My original intention was to do a survey of the magazine, picking out a volume from each decade, but I soon realized that that was a larger undertaking than just one post. If there’s enough interest, I’ll dive back in with another installment. But really, this is such an embarrassment of riches, with so much diverse material, that I can’t think of a better way to spend your magic dollar. The Conjuring Arts Research Center has done a tremendous job, and we are all in their debt for this magnificent contribution to magic history, made accessible to all.